Big greetings from Dayspring Ministries International, Nigeria to all the able ministers under the umbrella of this purposeful assembly, your prayers, love and encouragement has been keeping us on. By the grace of God, we have a lot of projects in mind especially this year of His grace 2005, five is for grace, in Him there is grace for greater work. DMI Nigeria is at the point of building on the foundation laid by Christ Himself. Always be with us in prayers, you will be hearing from us often. During the conference, answers were sought to the following questions. - Why am I in ministry? - What question am I here to answer? - What purpose am I here to fulfill? - What mission am I commissioned for? We realized that purpose is a driving force. Therefore, when a life is driven by a purpose, success is inevitable. Men of purpose are “Risk – Takers” “What do you have in your hand” was a recurrent question during the conference. This was actually the soul of the conference, stressing that God wanted people to start with what they have and believe God for that which they don’t have. The importance of faith was stressed. One of the speakers gave a teaching titled “Faith, the Jungle Boot for Missionaries”. Mission work is a venture of faith; faith in the person of God, faith in the word of God and faith in the faithfulness of God. It all started some years ago that God began to lay in my heart a very heavy burden for souls. 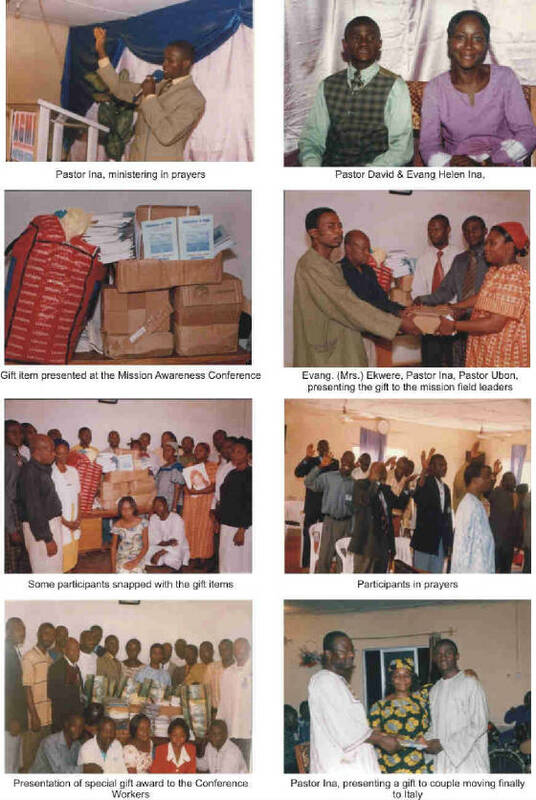 In 2001, I designed a programme to bring together field missionaries, Pastors and church worker together, especially those in the rural areas, to teach them and help equip them to reach the almost neglected rural dwellers. This group of people might not have money to pay their ways to Abuja. So I had to pray for provision from God so as to take care of their feeding, transport and to give them some kind of support to take home. That came to pass in February 2001 they come, we trained them, prayed for them and gave them books, bibles, clothing materials, detergent and some money to help transport them back to their different Mission Stations and States. They were really happy. All these things happened without a specific sponsor, but God. 1 Thess. 5:24. This is my belief, if a man has the call of God upon his life, he should start from somewhere but must make sure he doesn’t remain there. 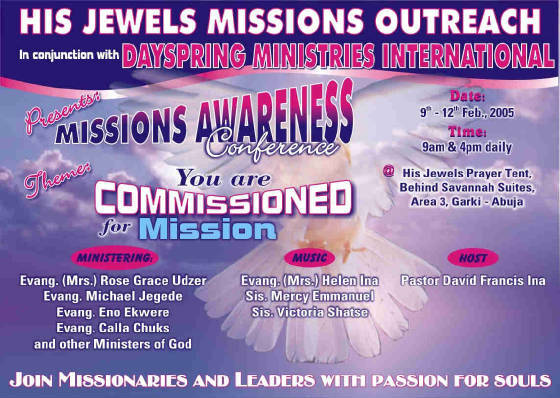 That is what has kept the CONFERENCE from 2001 to 2005 when we had the 4th Mission Awareness conference. We had printed the handbills to invite people to the conference which was to start on 9th February 2005 but as at Wednesday 9th February 2005, I had only few books and bibles together with other training materials. There was no money, no clothing materials to give to these people that are labouring in the rural area for God. I had to trust God and move to the venue of the conference. On Thursday 10th February I got four cartons of literature from Herald of His Coming and on Friday 11th February, a friend walked in and gave me some money. By Saturday, we had enough, at least to send them away happily because the guest speakers brought bags of clothing materials and some money. To God be the glory. Dearly beloved, God is faithful. He stands with and supports any project He initiates. I employ you to depend on God to finance your ministry. The future you are afraid of is safe. God is everywhere what he is doing in America, He is manifesting in a grand style in Africa. I feel like praying for you… you….. you….yes You!